Lets you see as you press! *Protects from shine - scorch -water spots and pressing marks. *Use with dry iron or steam. 1. Set iron to temperature recommended for fabric. 2. 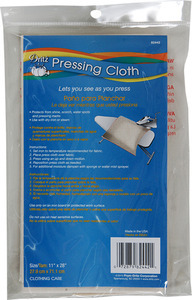 Place press cloth over fabric. 3. Press using an up and down motion. 4. Reposition press cloth as needed. 5. For additional moisture dampen with sponge or water mist sprayer. Use only on an iron board or protected work surface. Do not use on heat sensitive surfaces.WARNING: Keep this bag away from babies and children. Do not use in cribs - beds - carriages or playpens. The thin film may cling to nose and mouth and prevent breathing.